Hope in the Heart has been awarded Big Lottery funding to train women and mixed groups in Plymouth and London to become Compassionate Community Champions - learning to live more joyfully, effectively and compassionately in their lives, communities and world. Details here. We have also received funding from the Esme Fairbairn Trust, via POP+, to deliver workshops introducing the Compassionate Plymouth City Initiative, support local organisations, businesses, groups and institutions to become Charter Partners and develop a sustainable strategy for taking Compassionate Plymouth forward. Hope in the Heart CIC is a﻿ partner of international movement﻿ Charter for Compassion. Tam is an ambassador for CCI, co-founder of Compassionate Plymouth, Compassionate Cornwall and Compassionate London, and has links with Charter organisers and partners in many countries. Could your organisation be a Charter Partner? The Charter for Compassion is gradually growing in the UK, to join the vast movement of compassionate communities, organisations and individuals throughout the world. and more areas are signing up for the Compassionate Communities Initiatives . 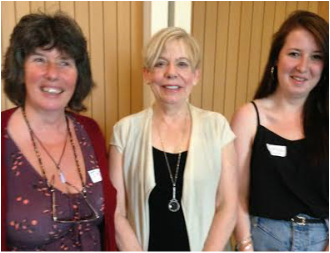 (Above: 1 - Fenna and Tam with author and Charter founder Karen Armstrong at the Charter's first UK Conference. Hope in the Heart is not associated with any religion or political party and respects the human rights of every person to a peaceful, free and just life.